I don’t know about you, but I feel as if Fall is right around the corner! Especially since my textbook size Fall editions of my favorite magazines have been arriving daily (my poor mail lady)! My favorite thing about Fall is the unveiling off all the latest fashion trends! So over the course of this week I’ll be sharing some of favorites with you! First up, Animal Prints! 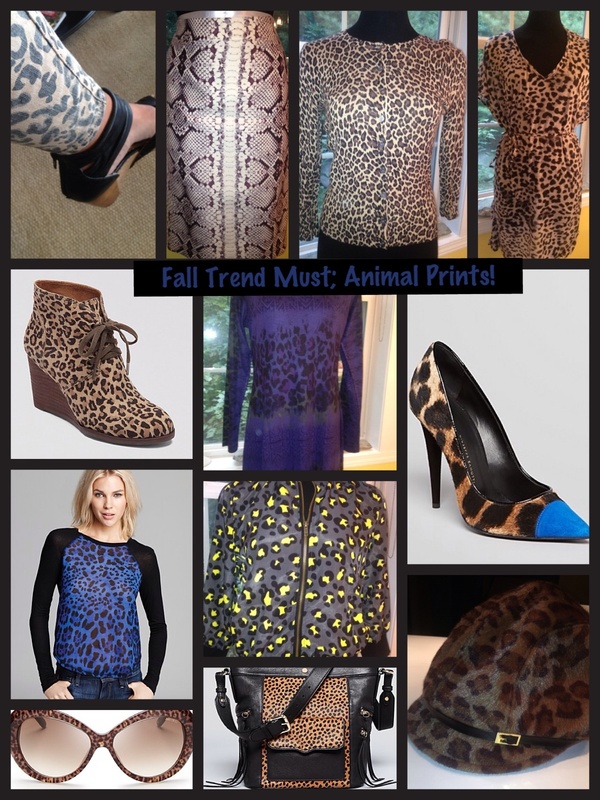 Most of these items are personally mine so as you can see I love animal prints! The best way to add this to your wardrobe is to think less is more! One animal at a time! When working with animal-phobic clients I recommend starting small. My #1 recommendations typically are a hair-calf leopard print skinny belt, a cheetah print scarf, a snake print clutch, or any other accessory and then work your way up with larger items! Animal print always adds fun, style, and a bit of sophistication to any look! I am so fortunate to be part of Stacy London’s (from What Not To Wear) network of fashion stylists. I just got off a call with her where we discussed all the trends for this month! I am so excited as I love them all and will feature a trend daily for the next 8 days!So keep tuning in! Today SWEATSHIRTS! Ahhh! Cozy, comfy sweatshirts, but on a sophisticated level! No Winnie-the-Pooh or Mickey Mouse here! We are talking sophisticated and stylish! Enough so you can wear one to the office, a night on the town, or just for running around on the weekends!